Boosting student learning in the areas of science, technology, engineering, and math—STEM—has long been a priority at many schools. More recently, educators and policymakers have stressed adding elements of art and design (a combined approach known as STEAM) to challenge students to think creatively to solve problems, as well as expanding STEM education opportunities at all grade levels. PTOs and PTAs can play a substantial role in promoting and supporting STEM and STEAM at their schools. 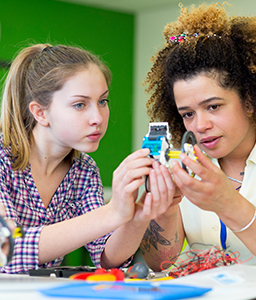 This guide to supporting STEM learning for PTOs and PTAs is a must-read for parent groups that want to do just that. An overview of STEM and STEAM—what they mean, and why they matter. Ideas for hands-on STEM events and science activities that groups can adapt to their schools. Ways to find STEM experts in your community. A calendar of STEM-related holidays and events. STEAM and STEM resources to help you plan activities. A list of STEM and STEAM books for children. Instructions to make your own kaleidoscope. Download the Complete Guide to Supporting STEM Learning for PTOs and PTAs for free.